There will be those who say that Pachauri’s resignation from the IPCC for sexual harassment charges will not hurt the IPCC. After all the transgressions of the Chairman are not necessarily those of others in the IPCC. The privileged arrogance of Pachauri parallels the privileged arrogance of the IPCC. Pachauri’s sleaze is now being exposed. The IPCC sleaze was revealed with Climategate. And glaciergate and global-ice-gate and global-warming-hiatus-gate and Kilimanjaro-gate. But with so many people in the IPCC the sleaze was spread thin. And we hear now that much of the supposed “global warming” is due to the use of “adjusted” temperatures to cool the past! The sleaze increases. Now even climate itself is denying the global warming /climate change creed. I remain hopeful that wallowing in the IPCC sleaze will eventually reach a critical level and become unacceptable. 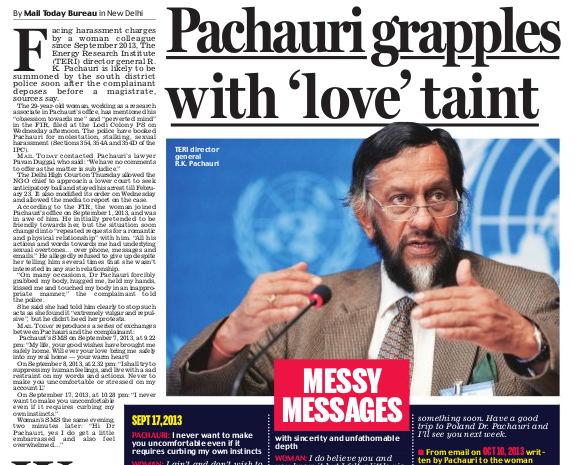 The Mail Today carries details of the “creepy” nature of Pachauri’s harassment. He sounds like a love-sick teenager. (I met him a few times back in 2000 when we were considering engaging TERI for a project. Partly because of the lack of impact he had, we engaged another party). The Daily Mail (Mail Today), has published a detailed report on the interaction between Pachauri and 29-year-old research associate who has sued him for sexual harassment. The several text messages and emails exchanged suggest that Pachauri was relentless in his pursuit of the woman, and had on one occasion embraced her and even tried to kiss her. When the woman ticked him off saying that such behaviour would not be entertained, he played a miffed teenager complaining that an act spurred by ‘love’ has been misunderstood by the victim as a case of sexual misdemeanour. “Please you are not to grab me and or kiss me,” the complainant told Pachauri in a text. It’s a bit of a horrifying image, but you can almost picture Pachauri pouting and crying ‘not fair’. While you might be shocked at the audacity of a man, who has been asked to back off by a woman for sexual misbehaviour, Pachauri’s defence will probably strike a chord with many in India. This entry was posted on February 24, 2015 at 7:51 pm and is filed under Alarmism, Behaviour. You can follow any responses to this entry through the RSS 2.0 feed. Both comments and pings are currently closed.